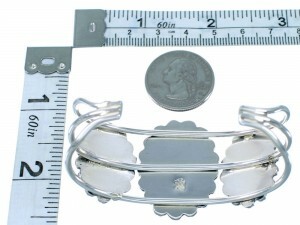 The inner bracelet circumference measures approximately 5", plus a 1-1/4" opening, and 1-3/8" at widest point. Looking at such beauty tells the capabilities of Native American art! 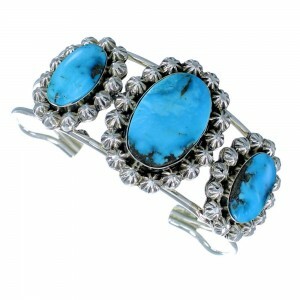 This piece of Native American jewelry is Navajo hand crafted by artist Mike Smith, out of genuine sterling silver and real Turquoise stones. 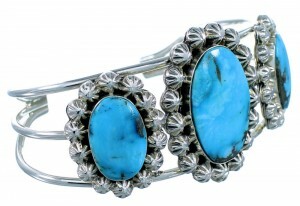 There are a total of THREE stones that are carefully placed in hand cut bezel settings, while mini stamped silver beads can be seen highlighting the stones for a magnificent look. 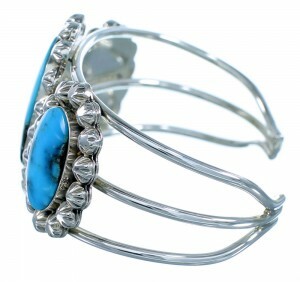 THREE silver bars make up the cuff, completing the bracelet beautifully! 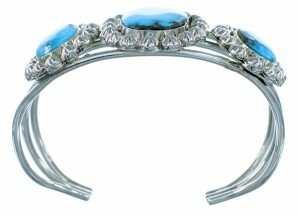 The bracelet is stamped .925 (sterling) and is hallmarked.